On July 19, my letter to the editor was published in the New York Times. 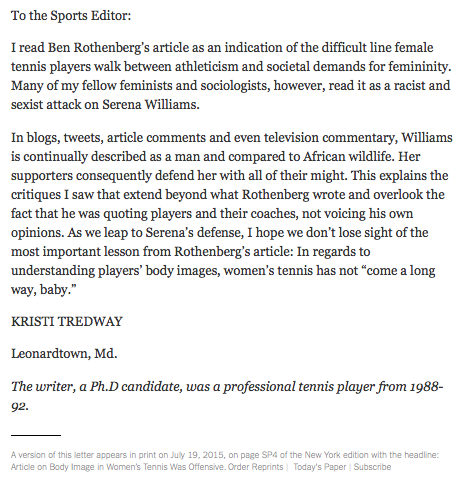 I was responding to the piece that Ben Rothenberg wrote on body image and women’s tennis, “Tennis’s Top Women Balance Body Image With Ambition.” Shortly after its publication, the article was attacked by feminists and sociologists as being racist and sexist, especially towards Serena Williams. My response as a letter to the editor of the New York Times was an attempt to show both sides of this controversy, what goes on in the press conference and what scholars were responding to. Rather than being disturbed that top female athletes have body issues and they expressed their feelings about their bodies, academic writers figuratively shot the messenger. That is simply a weak tactic for any scholar. Furthermore, in being upset with Rothenberg, these scholars are really saying that female athletes should not talk about these issues, which is a decidedly anti-feminist critique for any scholar. 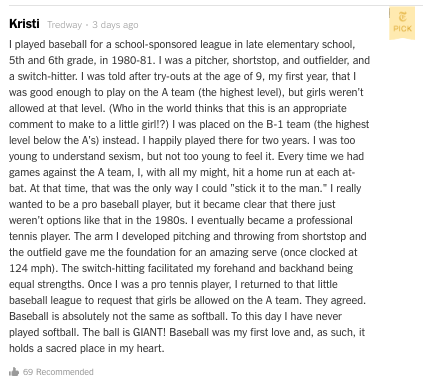 On June 6, 2014, Emma Span published an op-ed in the New York Times titled, “Is Softball Sexist?” In this piece, Span asserts that softball is a distinctly different sport than baseball and that there is no inherent need for girls to be pushed out of baseball and into softball. However, she warns that there is still attempts to undermine softball, opening it up to boys and men, though Title IX guards against this. The Women’s Studies Department at the University of Colorado publishes their own newsletter each quarter. For November, 2012, the newsletter featured me in the alumni spotlight.